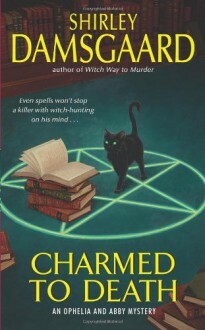 Ophelia Jensen's good witch granny Abigail revels in her paranormal powers. But Ophelia never asked for her bothersome psychic abilities -- especially since they proved worthless when the thirty-something librarian's best friend Brian was murdered by a still-unknown assailant. Now, five years later, another friend is gone, killed in almost identical fashion. Even dear old Abby isn't safe, distracted as she is by her fight to prevent a massive, mega-polluting pig-farming operation from invading their small Iowa town. And Ophelia can't count on her snarling, scoffing nemesis, police detective Henry Comacho, to get the job done, so she'll have to take matters into her own hands. Because a common thread to the crimes -- and a possible next victim -- is suddenly becoming troublingly apparent . . . and it's Ophelia Jensen herself! I've been finding with this series that the more I read, the more I like it. I'll be picking up her other books. The characters are interesting and the story fun. I might wish for a touch more romance for the main character, but other than that these have been very satisfying. This installment was a bit better than the first story. I really liked Henry's character if not his dialogue. He is the stronger of the males in Ophelia's life out of both books. Ophelia's character came to life a bit more while with Henry.The dialogue still suffered but Ophelia is starting to grow.